Authorities closed a chemical plant after local residents in central Hunan Province protested against cadmium pollution, which killed two people and affected hundreds of others, media reported on Monday, 3rd of August. The closure follows a number of recent high profile "mass incidents" which turned violent and prompted media criticism of officials' failure to respond quickly. Two villagers near the Xianghe Chemical Factory, which had produced zinc sulfate for six years, died in May and June. Autopsies found high levels of cadmium in their bodies, the semi-official China News Agency said. Tests conducted after their deaths found that over 500 out of nearly 3,000 local residents also had elevated levels of cadmium in their urine, it added. Around 30 people were admitted to hospital after checkups, Hong Kong media reported. About 1,000 villagers near the plant, located near Liuyang city of Hunan province, protested last week seeking closure of the plant. Residents of the town of Zhentou in Hunan province demonstrated outside local government headquarters and a police station, demanding greater compensation for pollution from the Xianhe Chemical Plant, protesters said. The protesters also said they came out to reject recent government health checks conducted on locals that officials claimed showed the situation was not serious, said a resident who gave only his surname, Chen. "More than 1,000 people came out over the past two days. We do not believe the government health check reports. Also, the compensation they are offering is too low and the soil is already polluted," he told media by phone. Six villagers were arrested during the protest on Wednesday, including one who was badly beaten by police, Hong Kong's pro-Beijing Ta Kung Pao newspaper reported. Thursday's protesters also demanded their release, Chen said. A female official reached by phone at Zhentou government headquarters defended the steps taken by authorities. "We have already done a lot of work on the pollution issue and announced compensation, but some people do not accept it," said the woman, who gave only her surname, Luo. "Instead, they spread rumours and inflate the problem. We do not know what they are up to." A local villager who also gave his surname as Luo told media his family of five had received 5,000 yuan (735 US dollars) in compensation. "That is too low. We demand that the government move us to a safer location," he said. Following their protest, the plant was closed "forever", the directors detained and the head of the municipal Environment Protection Bureau sacked, the China News Agency reported. Hunan province has tended to be tougher on plants that pollute the Xiang River, on which the provincial capital, Changsha, depends for its drinking water. The provincial people's congress requires annual reports on water quality, in another sign of the local representatives' concern. An environmental official admitted to heavy pollution of non-ferrous metals in the Xiang river, the financial magazine Caijing reported. 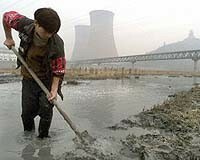 The illegal extraction of non-ferrous metals in the region has increased in recent years due to corruption, and hundreds of extraction plants are now discharging untreated chemical-laced sewage into the river, Caijing added. Vegetables grown along the river have also been found to contain high levels of cadmium, mercury and lead. State-run Xinhua news agency quoted Hunan officials saying the plant had been plagued by environmental problems since opening in 2004. These included releasing large amounts of highly toxic heavy metals such as cadmium into the local environment. The plant was ordered to close in March of this year, it said. Rapid economic growth in recent decades and routine flouting of rules have taken their toll on China's environment, say activists. China sees tens of thousands of public protests each year, many tied to anger over polluting industries. Meanwhile in the Southwest Province of Sichuan, the same human rights monitor reports that on the evening of 14 July a thousand parents stormed the town government building in Jiusicheng Town, smashing office appliances, beating the town head. In the clash with police that followed 10 were wounded. They were angry because personnel of the "Chengdu Yizhi Research Institute for Intellectual Development" used the same needle to draw blood for testing the "blood lead" levels of 600 children, one of whom was an AIDS carrier, in a cooperative campaign with the government. There are an increasing number of children in China with an excessively high lead level in blood because pollution is getting worse there. Since excessively high blood lead adversely affects intelligence, various medical institutions have thought of making money through blood lead examinations. By the small hours of 15 July, Xingwen County sent in 100 public security officers to prevent possible actions by the villagers to set the town government building on fire, etc. The public security officers clashed with the parents, wounding 10 of them. By the morning some of the parents were still demonstrating. The Xingwen County Hospital then dispatched 10 doctors to do blood tests on the 600 children to determine whether or not they have been infected with the AIDS virus. Five personnel of the institute were already put under criminal detention.